This loss was caused by a broken pipe in the ceiling of the second floor. The water damage affected three floors of the home. The water followed the patch of least resistance and puddled in the basement. The fire started in the kitchen of this dwelling. The damage caused by fire, smoke and water was so extensive the entire structure was damaged. No room was left unaffected. Dryer fires are almost as common as kitchen fires. After each use the lint catcher should be cleaned. Also it is necessary to clean the dryer exhaust vent to prevent a fire loss. The most common fire happens in the kitchen and is usually caused by the cook. Either the cook became distracted, fell asleep or in some instances left the home forgetting there was something on the stove. Yikes! 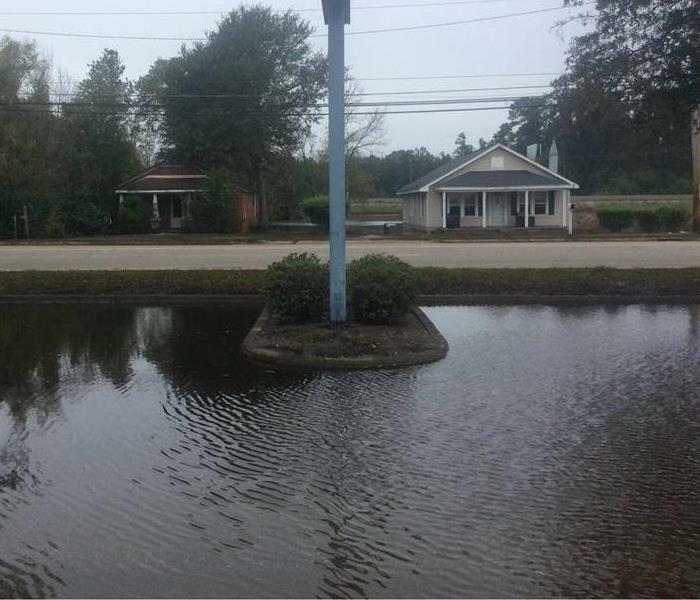 Believe it or not, flooding can happen anywhere in the US. 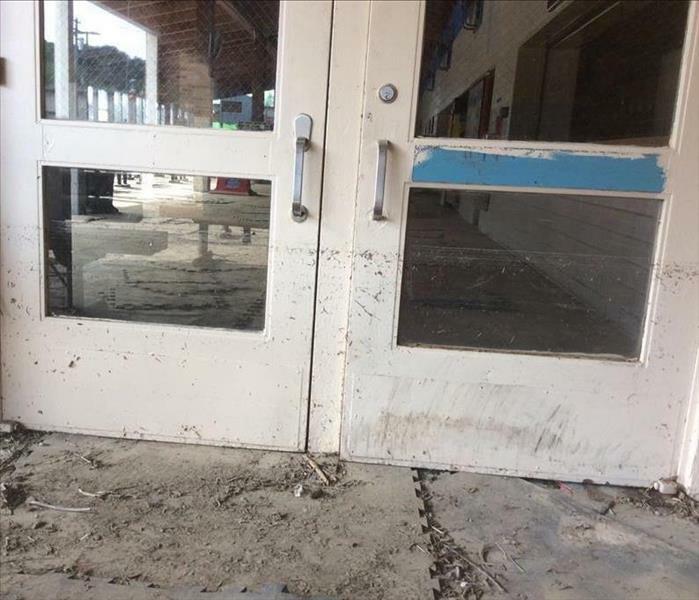 The water line on the doors proves how high the flood waters were which caused wide spread damage throughout the area. 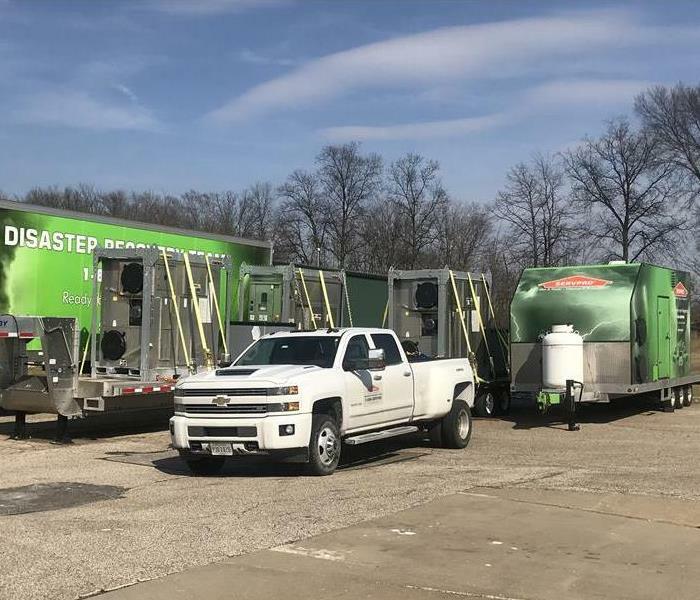 One of SERVPRO of Barberton/Norton's semi trailers being loaded up with equipment to assist with storm damage down south. 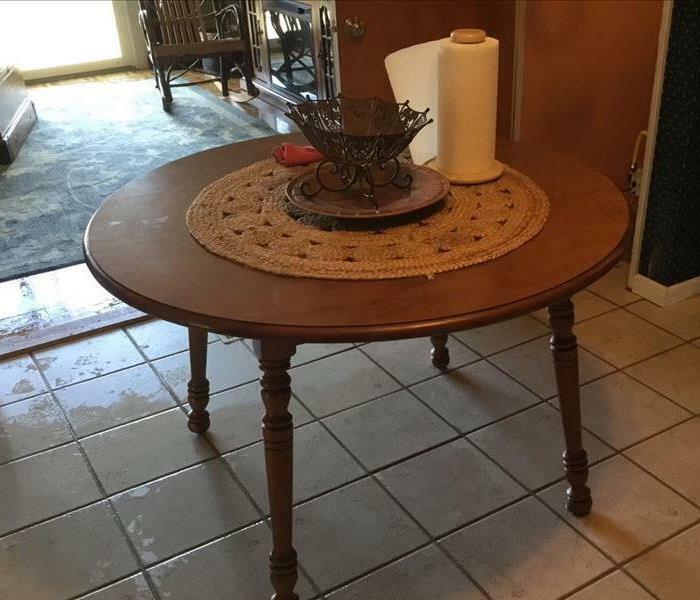 "Ready for whatever happens", no matter the size of the wind and water damage. Frozen pipes can cause wide spread water damage with even the smallest of leaks. 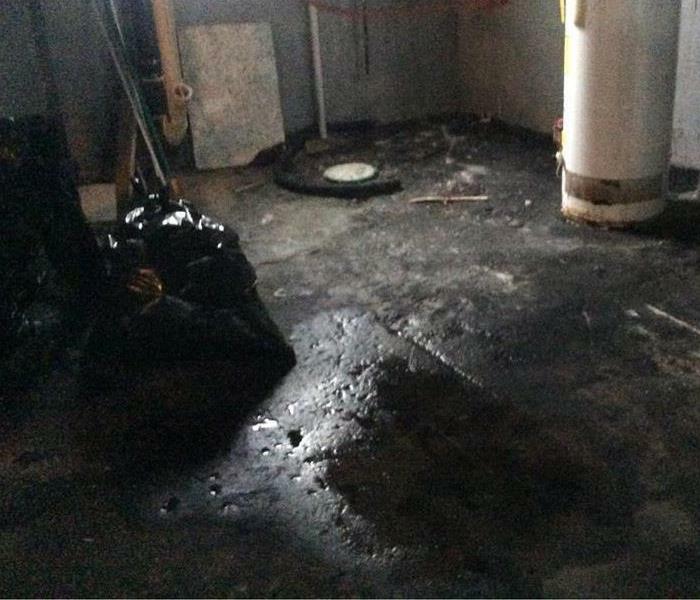 This home suffered a frozen pipe and water was found in every room of the house including the garage. 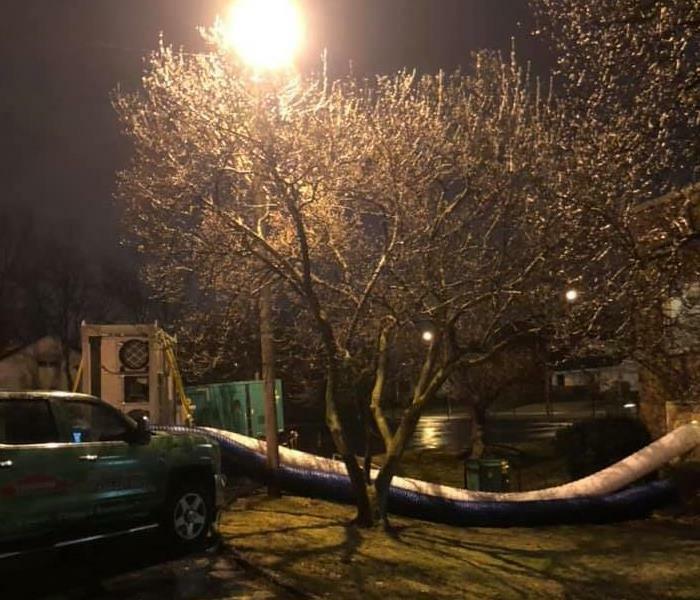 This winter's Polar Vortex caused a pipe to freeze and break at this customer's home. 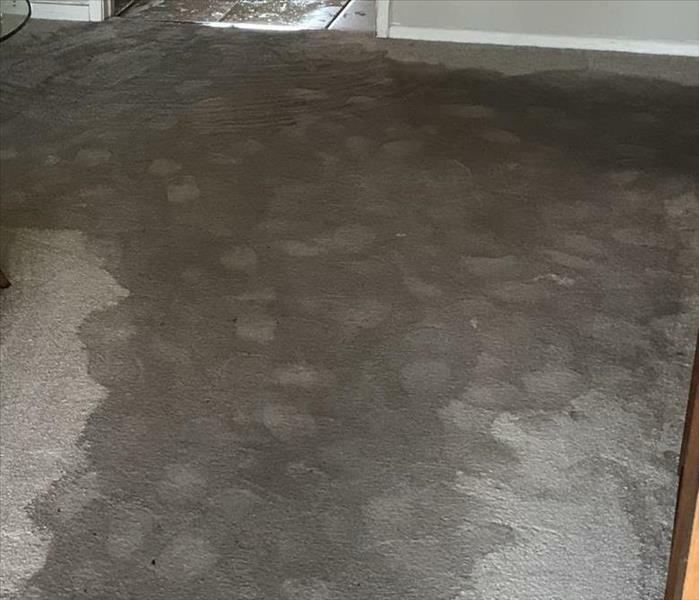 The pressure of the water caused water damage to every room in the house. 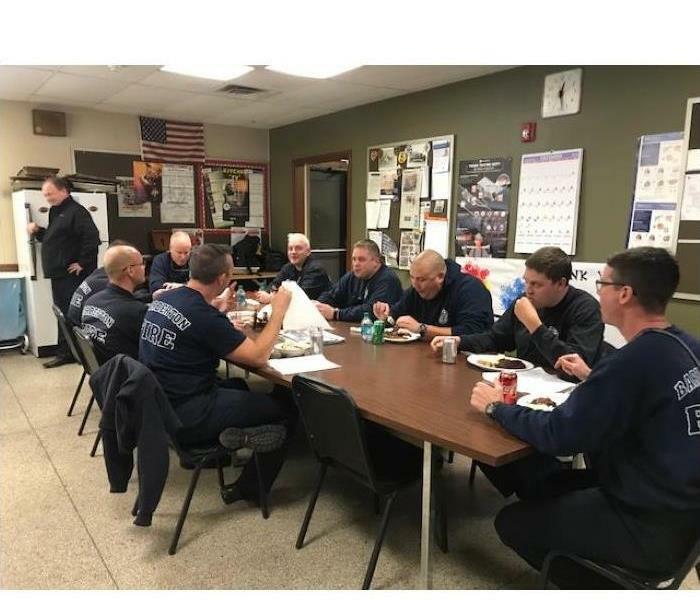 Barberton Firemen enjoyed lunch provided by SERVPRO of Barberton/Norton. As First Responders they put their lives on the line for us every time they are called. We wanted to thank them for their service. 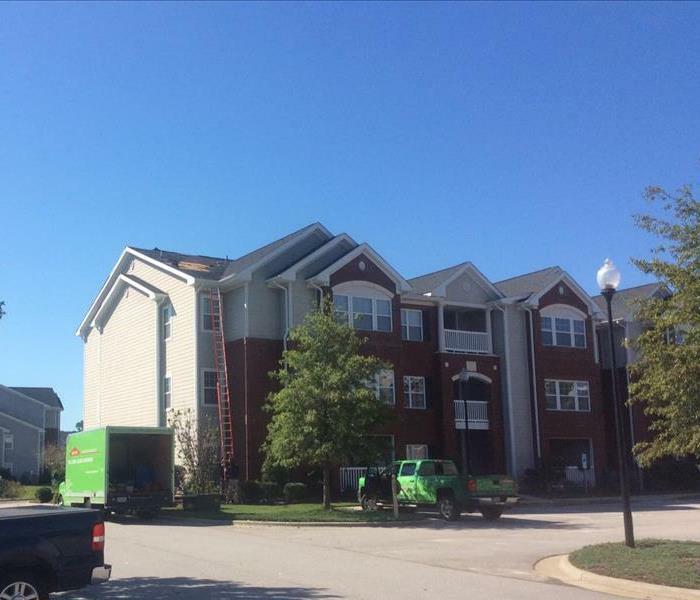 SERVPRO of Barberton/Norton has the all of the equipment to handle any size commercial job. Whether large or small we can do it all and make it "Like it never even happened." We were in North Carolina for the aftermath of Hurricane Florence. The hurricane caused wide spread wind damage with ensuing water damage. Our Storm Teams were there there to help! This picture is not a man made pone but a flooded parking lot. With the amount of water in the parking lot just imagine the amount of water damage the structure suffered! Our crews are highly trained and IICRC certified to handle losses that require Personal Protective Equipment, PPE. 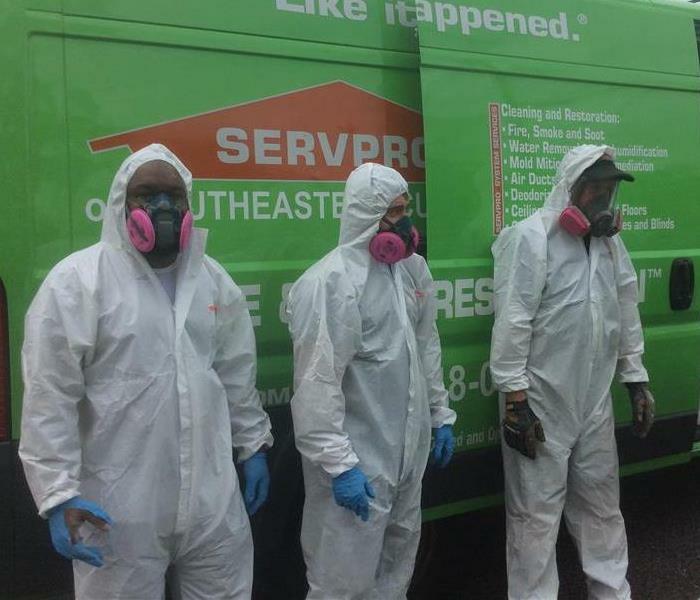 The PPE keeps our employees safe from any type of bio hazard cleanup needed. With our fleet that includes two semi trailers and 4 large desiccants we are able to dry the larges commercial building with ease. Our desiccants have helped other franchises too! This commercial loss being dried out by one of our large desiccants. As the equipment was being set up, the weather turned from warm with heavy rains to freezing rain, to ice then to snow. Working out of state is hard enough, when assisting with Storm Duty it can sometimes be near impossible to reach your destination. 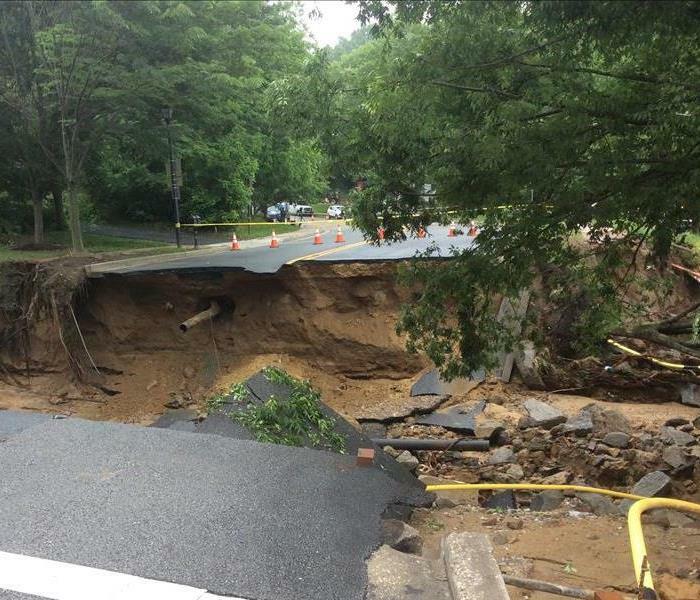 This road was washed out by severe flooding in Maryland. Part of our fleet, the smaller part, "Ready for whatever happens" including a new trailer equipped for priority responding for securing property. It includes permanently mounted generator and table saw. Lots of room for building materials too! SERVPRO of Barberton/Norton is a woman owned company. 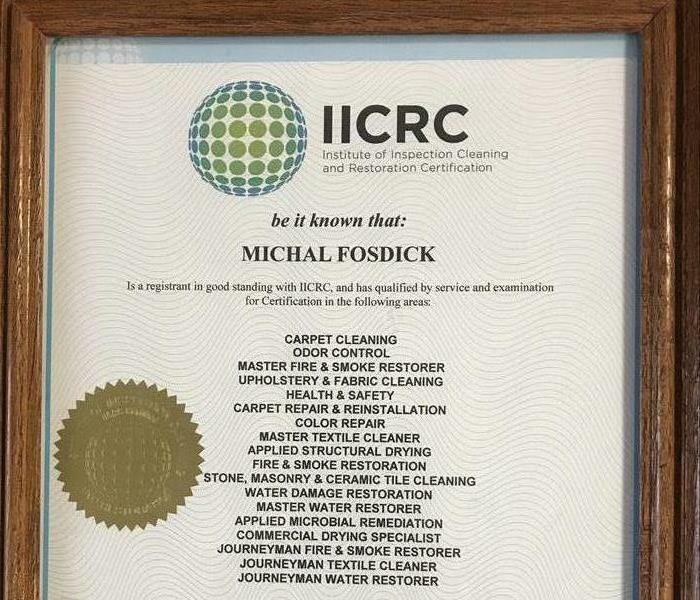 Michal Fosdick, owner, has been in the industry for 22+ years. Her many IICRC certifications speak for themselves and her notoriety within the industry speaks for itself. 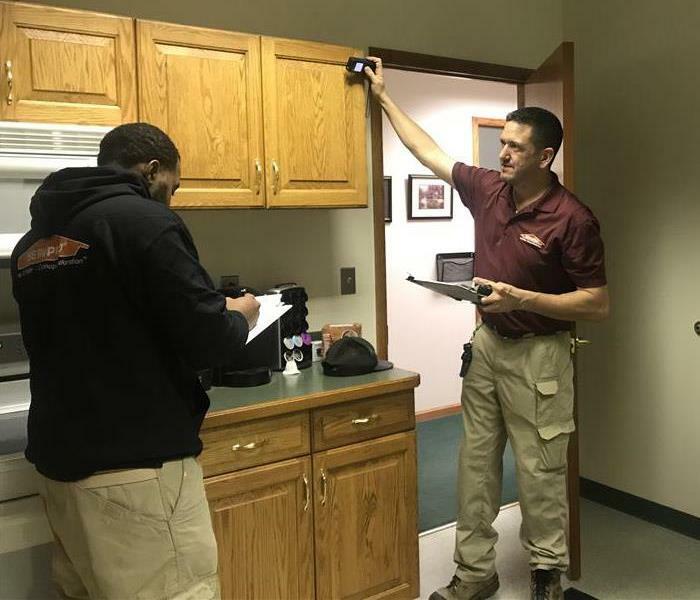 SERVPRO of Barberton/Norton provides in house training. The team is sketching the kitchen at our office. Writing an accruate scope streamlines the estimating process. The sketch is the blueprint of the damaged area which is needed to create the estimate. Hurricane Michael had devastating destruction throughout Georgia. 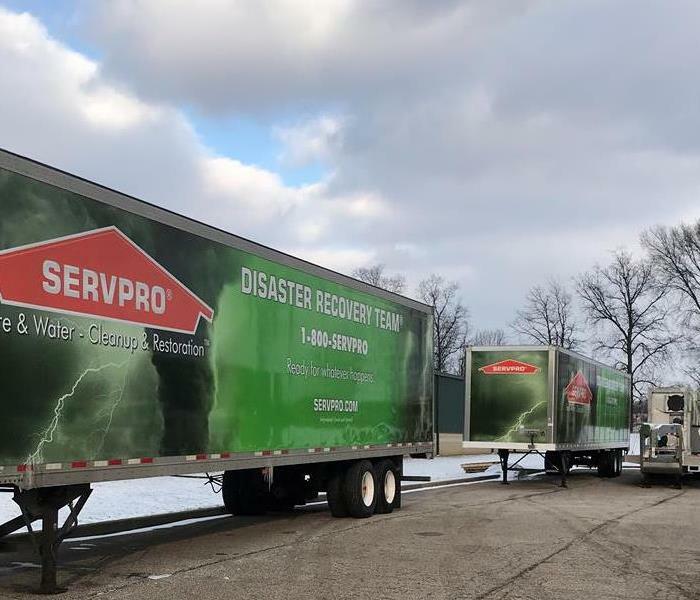 SERVPRO of Barberton/Norton traveled to assist with the clean up efforts. Our travel crews spent over 38 days on the road helping make it "Like it never even happened."